Has the saltiness, hardness, acidity or crunchiness of something that you have eaten lately has caused irritation inside your mouth? Most of us ignore these signs till the time we finally catch the sight of an unattractive and disturbing oral sore. Although these oral sores may look quite intimidating, canker sores neither has a serious occurrence nor are they daily life-threatening. However, canker sores can be bothersome and may cause discomfort and pain while eating. A canker sore is essentially an ailment that may pop out of nowhere on the inside of the lips, on the base of gums or on the tongue and may take days to go away. Three kinds of canker sores include major, minor and herpetiform. Canker sores must not be confused with the fever blisters or cold sores. Sometimes, canker sores may appear in clusters and the other times they may appear as one. They often heal without any treatment and are completely non-contagious. If you visit a doctor, he will most probably prescribe you a topical steroid in order to alleviate the pain that is associated with the condition. However, canker sores usually heal without consumption of any medication within 10 to 12 days. Natural remedies can help to ease the discomfort and irritation and aid in fast recovery. Homemade rinses can do wonders and considerably reduce the discomfort that is associated with canker sores. You can prepare homemade rinse by using ingredients such as baking soda, hydrogen peroxide and salt. For preparing canker sore rinse combine 2 ounces of water with 2 ounces of hydrogen peroxide. Alternatively mix 4 ounces of water with 1 teaspoon of baking soda and a teaspoon of salt. If you are experiencing extreme discomfort and pain because of canker sores, try placing wet black tea bags on the sores. Black tea contains an astringent known as Tannin which can considerably reduce discomfort. Prepare pure myrrh tincture and dab it on canker sores after every hour. You can also use its natural remedy to treat tongue and mouth ulcers. Sage infusion can be used as a mouthwash to get relief from the discomfort and pain caused by canker sore. Application of yogurt over the canker sores can help in alleviating the discomfort and pain caused by them. 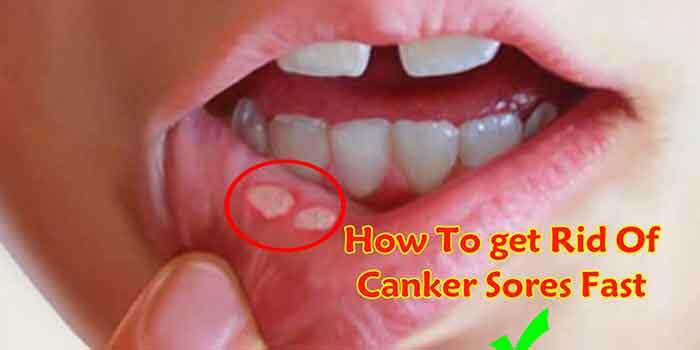 Eating yogurt on daily basis will also keep you away from canker sores. Yogurt also contains lactobacillus acidophilus bacteria which keeps the intestine healthy and keeps you away from canker sores. Vitamin E can be directly applied on lesions and sores inside the mouth. Vitamin E is known for its natural healing abilities and it is also a powerful antioxidant. You also have avocadoes as they are rich in vitamin E and can quickly heal the canker sores. Plum juice is another good option for treating canker sores. Take around 1 to 2 tablespoons of plum juice and use it as a mouthwash. You may also saturate a cotton ball with plum juice and press it against the sore for fast healing and relief from pain. In case canker sores continue to bother you, consulting a physician is recommended for other treatment options.